KC584 BIONICLE Key Chain is a BIONICLE Key Chains set released in 2003. It features the BIONICLE logo. 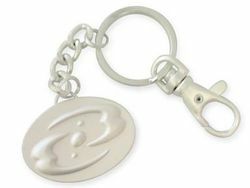 The key chain is made of a carabiner, attached into a metal loop. A chain runs from the loop of metal, and attaches into a small plate, with the BIONICLE logo engraved on it. It was only available to Shop@Home customers in Canada and the United States. Facts about "KC584 BIONICLE Key Chain"